Barataria Bay, Battle of New Orleans, Jean Lafitte, piracy in the U.S. Portrait of Lafitte by E. H. Suydam for Lyle Saxon’s book on the pirate. These are the final two lines from the Lord Byron poem, “The Corsair.” This widely popular poem could very well be based on the life and adventures of French-American pirate, Jean Lafitte. Many pirates leave behind treasure. Jean Lafitte left behind a legacy. 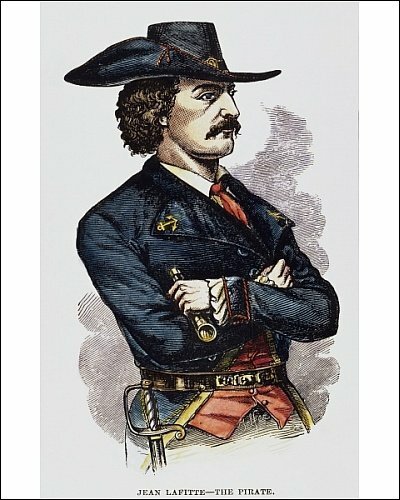 A man of French descent, Jean Lafitte managed a large smuggling settlement on the mouth of the Mississippi River coined Barataria Bay during the late eighteenth and early nineteenth centuries. This group of “privateers,” as they preferred to be called, pillaged foreign ships and resold their accumulated goods, including slaves, in a subversive marketplace. Jean Lafitte was a wanted man. He remained a wanted man, until the United States realized his military potential. In return for a pardon from the United States, Jean Lafitte fought on behalf of the United States in the War of 1812. The British made Lafitte generous offers similar to those of the United States. Without formal acceptance, Lafitte slyly negotiated with the British and passed on essential information to the United States that could prove useful in oncoming attacks. Jean Lafitte helped immensely in winning what became known as the Battle of New Orleans on January 8, 1814. 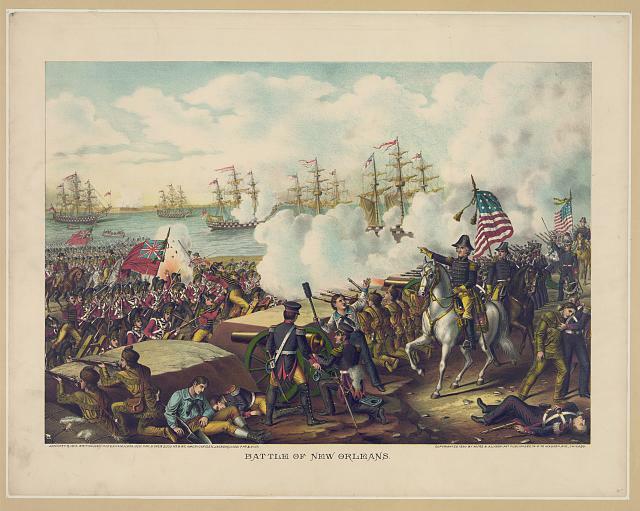 In this significant battle, U.S. forces led by Major General Andrew Jackson successfully warded off a British invasion of American territories accumulated from the Louisiana Purchase. Lafitte was responsible not only for readying his own group of privateers for battle, but for also supplying mass amounts of weaponry and gun powder, the bulk of which may or may not have been bootlegged. The daring nature and unwavering courage of Jean Lafitte and his men paid off. Lafitte and his battalion of pirates fought along side a diverse group of farmers, laborers, and slaves to defend America against British attack. In the spirit of freedom, these men fought relentlessly leading up to the British retreat. British losses added up to over 2,000, while the United States lost 101 collectively. The Battle of New Orleans was the final major battle of the War of 1812. Jean Lafitte and his Baratarian men, once thought a substantial nuisance to the provincial Governors of the day,2 ended up having an immensely positive impact in the Battle of New Orleans and the War of 1812 in its entirety. That is why Jean Lafitte’s legacy as a pirate may also be considered that of a patriot. Keyes, Pam. “How Laffite Became the Real-Life Byronic Hero.” Laffite Society Chronicles, 2012, 19-22. Sugden, John. “Jean Lafitte and the British Offer of 1814.” Louisiana History: The Journal of the Louisiana Historical Association 20, no. 2 (Spring 1979): 159-67. Geringer, Joseph. “Jean Lafitte: Gentleman Pirate Of New Orleans.” Crime Library. 2013. McManus, John C. “THE SPIRIT OF NEW ORLEANS.” Military History 25, no. 2 (May/June 2008): 28-33.